It’s the rainy season here, which I’ve been oblivious to for the past week because there’s been no rain. But on this morning, as I sit at a sidewalk cafe with my pal, Phúc, the skies are blackening. Phúc is going to translate if we can convince street vendors to sit down for a drink and an interview. We’ve planted ourselves at a table we know they’ll target. Street vendors are a regular, sometimes tiresome part of Saigon life. Sit outside with a coffee or beer and they’ll find you. They hawk snacks, cigarettes, pirated books and DVDs, watches, toys, chewing gum, marijuana, newspapers, streetside massages, sunglasses, and a long list of other stuff. Usually, I prefer that they leave me alone, but on this day, I’m waiting for them. A newspaper seller joins us for a Coke. We chat for ten minutes. 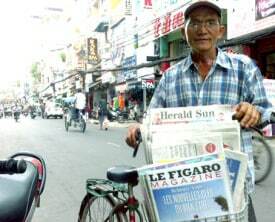 Then, as we step into the street so I can photograph him with his bike basket full of news, the first sprinkles begin. He rides off. Within minutes, drenching rain is pounding down. Wind gusts topple signs. Merchants whisk postcard displays into shops, and drape clothes racks in plastic sheets. People are scattering. Water is pooling at the curbs, their drains too small to handle the volume. The motorbike traffic lightens but doesn’t stop. People don one-dollar plastic ponchos and ride on. The water in the street is getting deep. We’re going to be stuck here a while. Phúc and I order lunch. Five minutes later, I spot one of the ladies who works at this café dashing down the road toward us. Her clothes are soaked. She turns, dripping and smiling, into the restaurant, which is when I realize something horrible: She has just run out for the sole purpose of buying rice noodles and beansprouts for our phở. If I knew she was going to do that in this weather, I would have ordered a pizza. The few pedestrians still out are walking in the center of the road. Walking in the middle of the road is quicker than the sidewalks, which are cluttered with restaurant tables, parked motorbikes, and a slew of other obstacles. One woman holds her three-year-old’s hand, giving her daughter a flattened plastic bag to use as an umbrella. Two people buzz past on a motorbike under shared poncho. Other motorcyclists don’t bother trying to stay dry. They squint through the raindrops, leaving a wake in the street. Three Australian backpackers on an important mission run through the water, now several inches deep. They duck into a kebab shop across the street. They must be damn good kebabs. There’s a jarring crash as lightning zaps a nearby phone tower atop one of the taller buildings. Waves are now lapping onto the sidewalk. Phúc and I move to a table one step up. It’s been 30 minutes since the rain started. 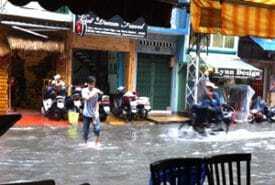 Bui Vien Street is a flowing river. Motorbikes and bicycles appear amphibious. A few lone food vendors push carts through the flood. A woman in a conical straw hat shuffles past. As she does, a speeding taxi douses her with a wall of muddy rainwater. Eventually the rain slows. People return to whatever they were doing earlier. Some wade through the street in flip-flops. Others go barefoot. Both, Phúc says, are bad ideas. A broken bottle or a syringe could make for a bad day. So when we finish eating, we wait. By the time the water recedes, Phúc must get back to his family. On this day, we don’t get the interviews we were hoping for, but we’ve seen a different side of Saigon life — common at this time of year, but less predictable than the street vendors. The rain lasted for around 30 minutes total. I shot these video clips as the water in the streets grew deeper. I just finished my Saigon trip and share my experience. 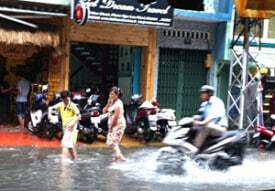 Saigon has two seasons: hot and rainy, sometimes it is gentle and sometimes it is difficult to understand. Sunshine in Saigon maybe intensive but summer wind will reduce heat much. 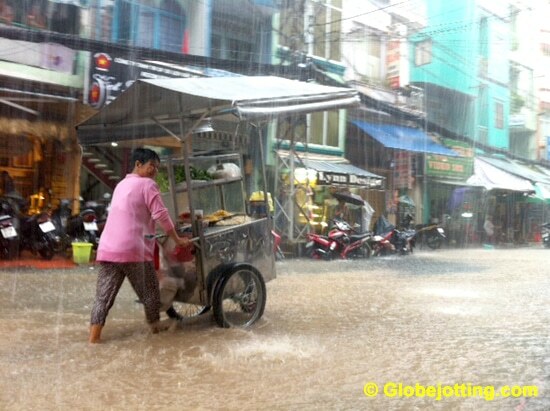 Saigon rain is very heavy but quickly stop.